I’ve been on several road trips lately, but I’ve been the driver on all of them. I’m a great multi-tasker (knitting while reading or watching TV), but I draw the line at knitting and driving. Fortunately, there’s a new way to road trip. JJ Foster, local knitter/instructor/former LYS owner/hospitality professional has come up with a fun concept: The Traveling Ewe. The Traveling Ewe is a new tour business focusing on knitters, crocheters and spinners. The Traveling Ewe will offer a new fiber-focused day trip every other month, starting with the Columbia Gorge Adventure on June 28th. Fiberistas will board a swanky luxury coach and head to Hood River for an inspiring day of crafting, eating and shopping. There will be time at Knot Another Hat, lunch at Celilio, a trip to Foothill Fibers Alpaca Farm and Store and, to end the day, a glass of wine on the sunny patio at Mt. Hood Winery . Tickets for this event are available at the Traveling Ewe website. This sounds like a perfect field trip for me, and no yellow schoolbus! I’m planning to go. Come join the fun! The sight of Mount Hood still thrills me every time, even though I grew up in Portland. 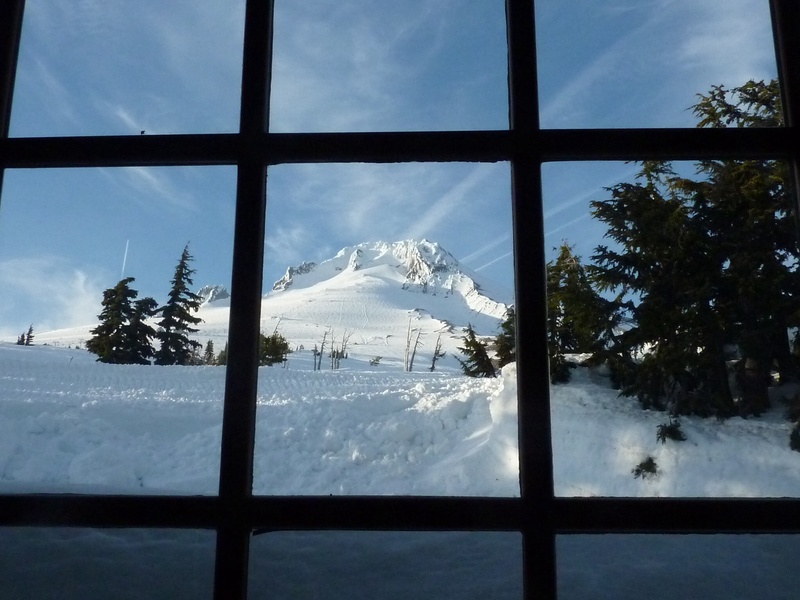 This is an old picture out the back window at Timberline Lodge. The last time I drove out I-84, I kept looking in my mirrors for a view of the mountain. It will be much safer snapping a picture when I’m not the driver! This entry was posted in events, travel and tagged columbia gorge, mount hood, road trip, Traveling Ewe. Bookmark the permalink. Just wish I lived in the Portland area – trips sound wonderful!